(PALM BEACH) – And they’re off…the Easter Seals Derby Day Party event plans are on track for the viewing of the 135th “Run for the Roses.” Committee members gathered recently for a luncheon at The Beach Club to discuss plans for the Southern style Derby celebration. Scheduled for Saturday, May 2, 2009 at the International Polo Club Palm Beach, this exciting event will benefit children with special needs at Easter Seals Igoe-Amar Child Development Center in West Palm Beach. Chairpersons Brenda and Robert Castellano, Barbara and RC Gilbert, Suzi and Richard Goldsmith, Lorrain and Malcolm Hall and Barbara and James Kravitz have been jockeying some exciting plans for the event. Guests will enjoy a live televised viewing of the race, old fashioned fun wagering, mint juleps and a Dixieland Band, followed by a silent auction, dinner and dancing. Honorary Chairpersons are Dr. Elizabeth Bowden, Norma and Simon C. Fireman, Arlette and Robert Gordon and Herme de Wyman Miro. Junior Chairs are Sue Gibson, Laura and Marc Sherman, and Suzy and Scott Rehl. Judith Morrell and Cynthia Maronet will serve as Auction Chairs. 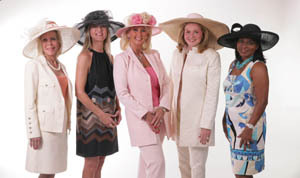 Tickets to the Derby Party are $325 per person. Proceeds from this event will benefit programs and services for children with special needs and disabilities at Easter Seals. Easter Seals Igoe-Amar Child Development Center is the area’s only full-time center for children of ALL abilities. Easter Seals’ helps children with disabling conditions due to birth, disease, accident or injury through pediatric speech, physical, occupational and behavioral therapies made available in a preschool setting. These services help prepare children for success in school while affording parents an opportunity to continue their careers or education.